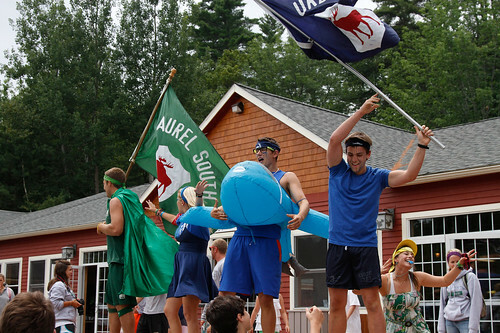 “Coves” are an important and exciting Camp Laurel South tradition. Each day begins with a Morning Cove at a campus “Cove site.” Each group meets at their own Campus Cove location, where the Campus Leader reviews information for the day: special activities, upcoming inter-camp games and tournaments, birthdays, cove-calls, cheers, sports scores, and many other special announcements. Each Campus Leader has his or her own style and flair which makes each morning Cove unique and fun. Cove is always a special time for the campers and staff and a great way to kick-off the camp day. Every night…just before dinner…the entire Laurel South family gathers for Evening Cove, led by our director, Roger. Evening Cove takes place at the Main Cove area, just above the magnificent shoreline of Crescent Lake. Evening Cove has been taking place at this very site since the first campers came to Laurel South decades ago. Once we hear the words: “What a beautiful day in the state of Maine!,” the tone has been set. Campuses may have a cheer to present…a birthday may be celebrated…Inter-camp results and special achievements or accomplishments are recognized…Evening programs are reviewed…special accolades are shared…Whether in the morning or evening, Cove is a coming-together, a celebration and recognition of how lucky we are to be at Laurel south in the beautiful state of Maine!!! This entry was posted in Uncategorized and tagged America's finest summer camps, American summer camps, benefits of summer camp, camp laurel south, children and ritual, children and routine, summer camp, summer camp rituals, summer camp routines, summer camp traditions on September 30, 2011 by Camp Laurel South.